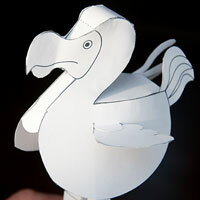 Back to the Dodo today! I've been working on the body layout. I started with a hand drawn model then, as per my usual workflow I cut the bits out and dropped them in the scanner. What you see here is the result after I've transfered the model to the computer. One of the many advantages of a computer based design is their easy editability. I made a model, found it was too small and quickly ran off another copy 20% larger. Easy! I going to be using the crank slider / cam mechanism in the final model but I'll be adapting the cam to tell a different story. I want a quick burst of flapping followed by a rest so I'll design a cam profile to meet that need. Everything seems to be going together quite well. Apart form the cam the only parts that I need to complete are the feet!